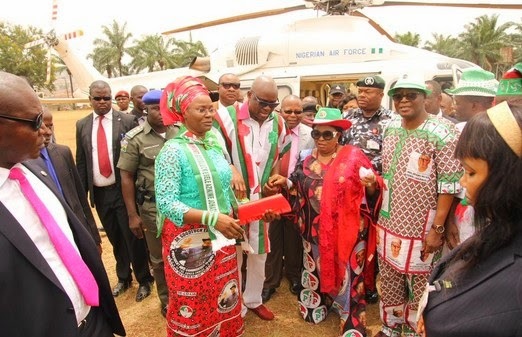 New day, new campaign rally, another outrageous remark by Dame Patience Jonathan. The comments by the First Lady are purportedly to campaign for the re-election of her husband, incumbent President, Goodluck Jonathan, but they may be having the opposite effect. 1. What did they forget in Aso Rock? If you vote the PDP and Jonathan, it would be better for you. If you vote the APC, you will go to prison. How can you jail somebody for 300 years? I’m not ready to carry food to my husband inside prison oh! Reports further state that during her speech, the women present were struggling over leftover rice distributed by Fayose. Sources say the women were also fighting over buckets presented by Senator Gbemi Saraki in commemoration of the October 16 inauguration of Fayose. The struggle reportedly almost turned into a stampede, with many women said to have been injured.